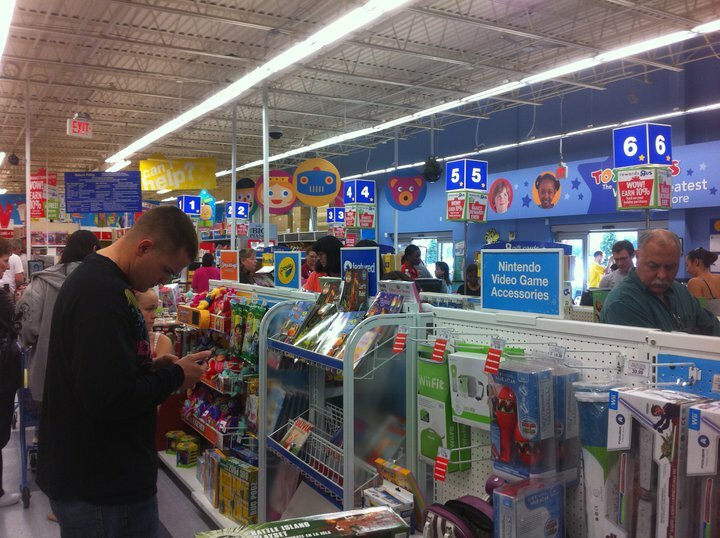 'Tis the season to be jolly...or to be stuck in this long line at Toys 'R' Us! This is where Matt and I stood yesterday with all the rest of these folks...waiting to make our last few purchases for the season. It was a long afternoon...and every part of my body hurt by time we pulled in the driveway last night. Matt had blisters on his feet. We shopped in three different cities and in 10 different stores. Now, we are not one of those overboard, crazy parents that get way too much. We have slimmed it down over the years...less each year. But shopping for five kids is a lot of work...trying to keep track of what we have already bought and who needs what. It is a job all by itself. And we have such a huge age range of ages in our house, that makes it difficult. Over half their presents are just needed items...new jammies, pants, shirts. And then the rest is fun stuff that we know they will enjoy. But other than their birthday, this is the only time my kids get anything extra (except seasonal clothing). We don't pick up new toys during the year like a lot of other parents. The other interesting aspect about shopping, is that my kids don't watch television...so over 90% of the stuff in the stores my kids don't even know about. New action figures, or games...they are oblivious. It made it hard to pick out gifts because they are not going to be excited about something they have never seen. So, we stick with the more traditional presents...trucks, army men, legos and doll house items. Makes life a whole lot easier. The best part of the whole day, was Matt and I spending time together...talking about our kids and being with each other. What a fantastic date! So I am getting really excited for Christmas...except until I realize I have to wrap all of this!